Best Backpacking Sleeping Bag Reviews - Is Suise Sport #1? If you could describe the ideal backpacking trip in one word, it’s freedom. Backpacking gives you the opportunity to go wherever you want, whenever you want, and the ability to stay and explore the area as long as you desire. Backpacking takes you to remote places that are not accessible by plane or car. Everything that you need can be carried on your back. This means that everything in your pack needs to serve a purpose and be extra-lightweight, including your sleeping system - even if it's as small as the best bivvy sack. Backpacking sleeping bags are specially designed to hold in warmth. The best backpacking sleeping bag rolls up compactly and are light to carry. However, we still recommend a lightweight sleeping pad so it doesn't feel like you're just sleeping on rock all night! Backpacking sleeping bags may look the same as a sleeping bag that is designed for camping, but there is a little more than meets the eye. It’s important for your backpacking sleeping bag to be lightweight and utilitarian, just as all of your camping gear should be. A camping sleeping bag may be thicker than a backpacking sleeping bag, as long as they roll up fairly tightly for storage. Weight is not generally an issue when looking for a sleeping bag that it intended for use in a tent or RV. Backpacking tents need to have a tight weave to keep cold air out. They should roll up tightly, alleviating bulk, so they don’t take up so much room in the pack. They also need to be as ultra-lightweight as possible. Look for a sleeping bag that has an attached hood that adjusts with a string cord. Pack a sleeping bag liner for a little extra warmth if you're not using a 0 degree sleeping bag. This mummy bag is ultra-lightweight, yet still very comfortable making it our #1 overall choice. It is durable and water-resistant and the zippers are fully taped and have an anti-snag design. It fits compactly in the lower sleeping bag compartment of most hiking backpacks and has an interior pocket to hold your electronics or personal items, making it ideal for hiking and backpacking. This sleeping bag only weighs 2 pounds and compacts down to 10” x 7” or less, so it’s perfect for backpacking. It’s a great sleeping bag for colder temperatures and will keep you warm down to 35 degrees. Pull the drawstring tight to snug it around your face. Zip two of them together to make a double sleeping bag. This mummy-style backpacking sleeping bag keeps you warm down to -52 degrees, so it’s extra-warm while being ultra-lightweight. It has a 260 thread count microfiber lining for extra cushioning. If it was good enough for the first woman to climb Mt. Everest, it’s certainly good enough for you! Suisse Sport makes this double-layer compression sack with a drawstring hood and draft tube for additional protection against the cold. It compacts to 12” x 7” x 7” and opens up to 29.5” x 84.5”. Use it for temperatures as low as 30 degrees. It’s rated as the best-selling adult-sized sleeping bag for backpacking. This sleeping bag compresses down tightly, while being ultra-lightweight and also providing superior warmth. It is specially designed with tactical quality to reduce humidity, condensation, and sweat. It has a box baffle construction with ground-level side seams. The differential cut helps keep in warmth. It’s great for backpacking, biking, scouts, and camping. This is a 3-season backpack that weighs only 3 pounds. It fits people up to 6’ tall. It’s made of Thermapro synthetic insulation, which is a fiber blend. It will keep you warm down to 22 degrees and is specifically engineered to compress down for easy packing. It has a zipper on the lower end so that you can unzip it to create some ventilation. This sleeping bag will keep you extra-warm, even on high-altitude mountaineering trips. It will even keep you warm when it’s 5 degrees. It has a double layer and offset quilt construction to eliminate cold spots. It has a drawstring hood and draft tube. It’s a little heavier than some backpacking sleeping bags, but the extra warmth capabilities make it worth it. When looking for a backpacking sleeping bag, make size, compressibility, weight, and warmth ratings your top priorities. If you’re backpacking in areas where temperatures are likely to drop, it may be better to opt for a heavier sleeping bag and reduce the weight of the other items in your backpack as much as possible. Down is a popular material for stuffing winter coats, bed pillows, comforters, and sleeping bags. Down is a layer of fine feathers that lies just under the tougher, exterior feathers of birds. It is also the fluffy layer of feathers on younger birds. Down makes an excellent thermal insulator and is very soft to snuggle up with. Because natural down comes from birds, it is more expensive than products made with synthetic materials. If you shop around, it’s possible to find quality products that are filled with down that are also affordable. The difference between having a positive or negative outdoor adventure can come down to whether you take the right gear along on your camping or backpacking trip. It’s a great idea to do a little research regarding the items that will make you the most comfortable. It’s a lot easier to overlook certain inconveniences, but regardless of what kind of trip you take, you’ll want to make your sleeping system your first priority. It’s much easier to enjoy daytime outdoors when are well rested. There’s a place for synthetic and down fillers when choosing outdoor sleeping items. Down has a better warmth-to-weight ratio, so it will usually be lighter than synthetics. Strong warmth ratings and the compact-ability qualities make down sleeping bags a great choice for camping and backpacking. Down has a higher loft capability, so it compresses down more compactly than synthetic material, which makes it a better choice for backpackers. One of the negatives of down is that its dampness causes it to lose some of its insulating properties. If you think you’ll be camping in wet conditions, synthetic sleeping bags may be a better choice. Both synthetic and down sleeping bags come in rectangle and mummy-styles. Down sleeping bags are more expensive than synthetic sleeping bags, but depending upon how you intend to use them, they may be worth the extra cost. Kelty makes this polyester taffeta down sleeping bag with a natural-fit footbox. It also has a 60” dual-slider locking zipper with draft tube and anti-snag design. It has drawcords to pull the hood tightly around you. The down compresses tightly and stores away In the handy stuff sack. Stay warm when the temperatures dip down to 20 degrees. Use this down sleeping bed three seasons of the year. It can get down to 15 degrees and you’ll still feel warm. It packs down tightly, but puffs up nicely when you want to use it. The blue one has a right-hand zipper and the red one has a left-hand zipper. Take one of each and zip them together to make a double sleeping bag and increase the interior heat by 25%. It comes with reinforced zippers, zipper guards, a compression sack, hanging hooks, and an interior pocket. Outdoor Vitals makes this 800 down-filled sleeping bag with a rip-stop polyester outer-shell covering. It has a great loft that will keep you warm down to 20 degrees. It only weighs 2 pounds, 8 ounces. It compresses down to 8.5” x 7.5” x 7.5” to stuff into the carry sack. If you are not satisfied, it comes with a 1-year limited warranty. Aektive makes this sleeping bag that is filled with natural goose-down. It’s ultra-lightweight and works great for three seasons of the year. Stay warm in this sleeping bag when the temperatures dip down to 15 degrees. It comes with a compression sack for storage and has hanging hooks to dry it. Store your cell phone or wallet in the interior pocket. It also has a little built-in space for your feet. This is a lightweight, 2-season sleeping bag that is filled with a 700 fill-power Dri-Down insulation. It stays drier, lofts higher, and dries faster. The regular size fits a person up to 6’ tall and the long version sleeps someone up to 6’6” tall. You will stay warm when the temperature drops to 34 degrees. If you will be camping or backpacking in the colder temperatures, not just any down sleeping bag will do. You’ll want to check to make sure that it’s made with natural down and that it will keep you warm in whatever temperatures you expect. You’ll also want a drawstring hood that you can tie around your face. Also, look for an outer shell that is water-resistant. Most sleeping bags are rated to keep the average person warm when the temperature is between 15 and 50 degrees, so you’ll have no trouble locating sleeping bags with a 20 degree temperature rating. Look for sleeping bags with a double layer construction and off-set quilting. This type of design eliminates pockets where cold air gets through. You’ll also want to make sure that the outer shell is water-resistant and that it has a zipper tube that prevents cold air from entering through the zipper. Most 20 Degree bags will have hoods with a drawstring that pulls the hood tightly around your face. Be aware that the 20 Degree rating is merely a guide that varies between campers. Going camping or backpacking in the winter requires advance planning. Taking a sleeping bag that is properly rated for the temperatures makes all the difference between having a rewarding and successful trip and a frustrating, unsuccessful trip. Sleeping bags are tested in varying temperatures to determine the lowest temperature that will keep the average person comfortable. People’s body temperatures and individual metabolisms vary widely, so the ratings are intended to be used only as a guide. Each person has to determine their own comfort level. As a guide, summer season sleeping bags are rated for temperatures 35 degrees and higher. Three-season bags are rated for 10-35 degrees. Anything lower than 10 degrees is considered a winter-rated bag. While temperature ratings are important, they should be considered one part of the overall sleep system for camping. The sleeping bag doesn’t do so well on its own, so it takes a little help from other camping gear. 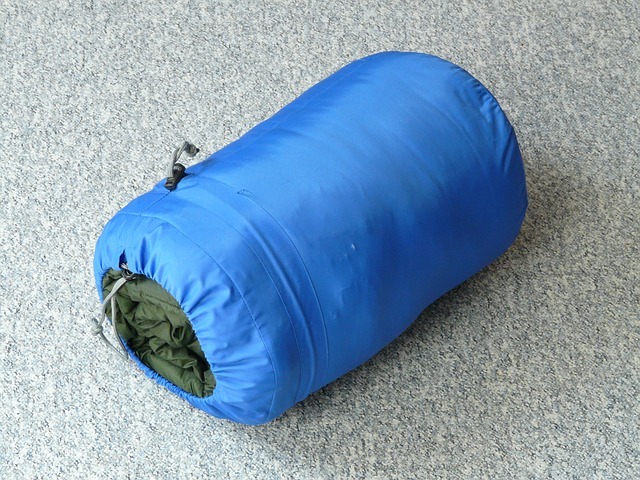 A sleeping pad or air mattress separates the bag from the cold air on the ground. A sleeping bag liner helps keep warm air inside the bag. Don’t forget about the added benefits of thermal underwear, coats, hats, and gloves to ensure a warm sleep during your winter camping trip. TETON designed this mummy bag to be comfortable and lightweight. It’s a bit longer and wider than other mummy sleeping bags to accommodate larger people. It has a soft, breathable liner and extended foot box, so you can move your feet around a bit. It has interior and exterior zipper pulls that extend the length of the bag. Zippers are fully-taped with an anti-snag design. This sleeping bag by Coleman is made with a fiberlock construction that prevents the insulation from shifting and gives the bag longer life. The outer shell is made of 100% polyester and the lining is made of knit tricot. It fits heights of up to 5’ 11” and is machine washable. It has a specially-designed zipper system that prevents the fabric from catching in the zipper, even around the corners. This sleeping bag keeps you warm from head to toe with the thermal-comfort hood and natural-fit footbox. It has a dual-sliding, locking zipper with a draft tube and an anti-snag design. It has a polyester taffeta shell that keeps the weight down to about 3 pounds. It has FatMan and Ribbon draw cords and comes with a compression stuff sack. For a sleeping bag that keeps you warm down to 20 degrees, Slumberjack insulated this sleeping bag with two-layer, off-set construction and differential cut to prevent cold spots. The flip-over hood converts to use it as a flat hood, or tie the drawstring for a tightly contoured fit around your face and head. This sleeping bag weighs just under 4 pounds. Here’s a 20 Degree sleeping bag that is designed for the younger set—teens aged 10-14 years. It is filled with Cloud Loft insulation and fits teens up to 5’4”. It has a full zipper that opens at the feet section, so you can get ventilation when it’s too hot. It also has a draw cord around the hood to contour the hood around the face. It comes in purple for girls and ocean blue for boys. This 3-season sleeping bag keeps you warm and dry. The dual-locking zipper makes it easy to get in and out of this mummy-style bag in pink. This bag is filled with Dri-Down, a down-process that enhances heat retention. 20 Degree sleeping bags are designed for the people who use them. Winter camping is for men and women. Older kids are also starting to learn about and experience winter camping. Manufacturers have designed the perfect bag for every type of camper. The key to a great adventure starts with a lightweight pack and a sleeping system that keeps you warm and dry throughout the trip. Your adventure ends with memories that last a lifetime.